THQ is hoping families will get in touch with their inner artists and use its uDraw GameTablet to create digital masterpieces. 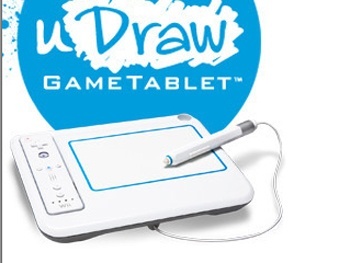 There's big money to be made in the field of Wii accessories and THQ is clearly hoping to turn its lackluster profits around with its upcoming uDraw GameTablet, a new digital sketchpad designed specifically for Nintendo's home console. According to the publisher, there's a little something for everyone here: Not only can you draw and play games with your family, but students will also - theoretically - be able to use the hardware as a learning tool. THQ is clearly trying to market the uDraw GameTablet to entire families. One of its big selling points is that kids can save their artwork to an SD card and then, "print their artwork out for display on the refrigerator." Meanwhile, according to Martin Good, an Executive Vice President of THQ, "students can improve their skills through in-game tutorial lessons. And the whole family can sit down together for family game time with products like Pictionary." That part about students using the hardware to learn seems plausible, but it appears to be nothing but puffery at the moment, since none of the announced uDraw-compatible games sound particularly educational. The tablet will ship with uDraw Studio with a suggested price tag of $69.99. Meanwhile, Pictionary and Dood's Big Adventure (which are being designed with the hardware specifically in mind) will be released on the same day. The hardware and these games are currently scheduled to be released in 2011. Of course, the first thing I thought of when I read about this device was how it'd be great for a Wii version of Mario Paint. Nintendo has yet to announce any such plans, but I'm sure there are a number of gamers who would happily embrace a Mario Paint/uDraw GameTablet bundle.